Woehner USA, a leading provider of electrical and photovoltaic power distribution solutions, has received a notice of authorization from Underwriters Laboratories (UL) that three of their fuse holders for 1500-Vdc photovoltaic applications have been certified to the UL4248-18 standard. The three fuse base holders are the PVH-NH1XL, PVH-NH2XL/3L and the AMBUS EasySwitch holder for 10X85 cylindrical fuses (AES10x85). 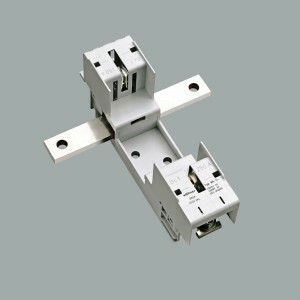 All are traditionally panel mounted and are suitable for DIN-rails or mounting plates. All three fuse base holders are used in balance of system assemblies produced by combiner box and inverter manufacturers to protect the wires and cables in a DC power distribution system of utility or commercial scale photovoltaic installations. As photovoltaic system voltages migrate to higher levels, and with 1500 Vdc now the new target, manufacturers will be looking for the ability to mount fuses associated with the increased value. This voltage enhances the efficiency of the power conversion equipment and lowers the cost of the copper cabling required on the project. The race to 1500 Vdc is seen as a critical mile-marker for PV system sustainability. The UL component certification differentiates Woehner from its competitors. “The UL mark has become a make or break formality for component manufacturers. Achieving a UL listing indicates that we have market-ready products that meet high standards of performance and can be used with confidence,” concludes Saunders. The PVH-NH1XL and PVH-NH2XL/3L photovoltaic fuse holders are used for 250A and 600A applications. Both can be connected either cable-to-cable or cable-to-busbar. They are suitable for use with NH1XL, NH2XL or NH3L photovoltaic fuses. Woehner is the first company to offer a busbar connection that is physically mounted under these fuses. This feature saves cabling space in the re-combiner box or inverter assembly. The AES10x85 is a cylindrical photovoltaic fuse holder for 30A applications. Woehner is the only manufacturer of dead-front, DIN-mount, finger-safe fuse holder for 10x85mm fuses, good for up to 1500 Vdc.